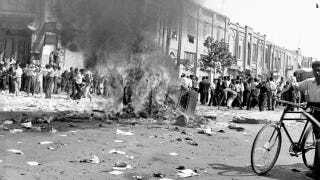 The State Department has blocked the release of declassified documents about the CIA's role in the 1953 coup that overthrew Iran's democratically elected prime minister, due to the ongoing negotiations with Tehran over its nuclear program. But some historians think this is a dumb decision, that could actually backfire. The documents at the source of the controversy appear in a volume of The Foreign Relations of the United States (FRUS). Compiled by State Department historians, the FRUS series is an invaluable resource, containing declassified documents that include diplomatic cables, candid internal memos and minutes of meetings between the president and his closest advisors. The volume on Iran had been slated for publication last summer, but was delayed in September and again this week. In 1953, the UK and the U.S. decided to remove Prime Minister Mohammad Mosaddegh from power, after he nationalized the country's oil industry, which, until that time, had been owned and operated by the British. After the coup, the Shah was installed as Iran's absolute monarch until he was overthrown during the 1979 revolution. "The logic, as I understand it, is that the release of the volume could aggravate anti-U.S. sentiment in Iran and thereby diminish the prospects of the nuclear negotiations reaching a settlement," said Prof. Richard H. Immerman, a historian at Temple University and the chair of the State Department Historical Advisory Committee. "I understand the State Department's caution, but I don't agree with the position," he said. "Not only is the 1953 covert action in Iran an open secret, but it was also a motive for taking hostages in 1979. The longer the U.S. withholds the volume, the longer the issue will fester." Besides, if the documents do have the power to shape events, maybe that power could be harnessed to constructive ends. "I would argue that our government's commitment to transparency as signaled by the release of this volume could have a transformative effect on the negotiations, and that effect would increase the likelihood of a settlement," Prof. Immerman suggested. "At least some in the Iranian government would applaud this openness and seek to reciprocate. Further, the State Department of 2014 would distinguish this administration from the 'Great Satan' image of 1953 and after," he said.